We have partnered with Gamelyn Games to bring Tiny Epic Galaxies to Tabletop Simulator as official DLC, which was released on Steam on September 23, 2016. In Tiny Epic Defenders a cooperative board game, players must select their class and work together to defend the foreboding horde and slay the Epic Foe. Will you take on the role of the Barbarian, the Sorcerer, the Cleric or the Warlord? Each class has a unique player power that you will need to utilize. In this fast-paced game, players will scramble between various regions outside their Capital City fighting off enemy hordes! Each region offers unique properties that players must calculate into their strategy If your group is fortunate enough to defeat the wave of monsters, you may live long enough to face the Epic Foe! Which Epic foe will it be? Will you be prepared!? Does your group have what it takes to survive? Will you have the synergy to be crowned the Tiny Epic Defenders!? 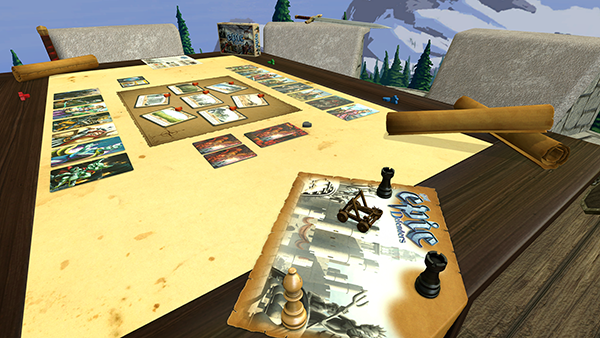 Everyone must own Tabletop Simulator in order to play Tiny Epic Defenders.